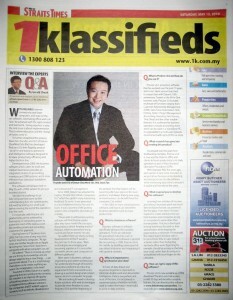 NST: Interview The Experts Q&A - Datum ClearMind s.b. WITH RELIABLE internet connectivity and faster computers, and state-of-the-art software, automating office work can now be achieved with the right mindset and teamwork. Going paperless is easy, the only issue is about implementation. That is where education and the change of habits come in. 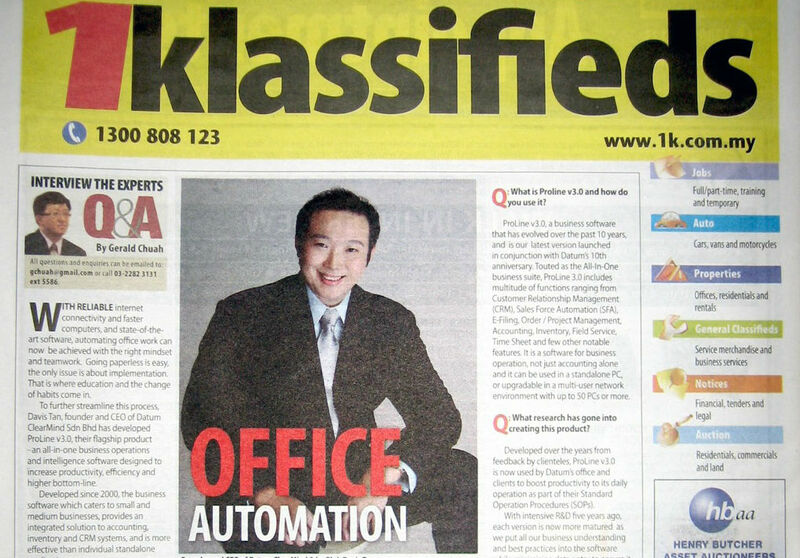 To further streamline this process, Davis Tan, founder and CEO of Datum ClearMind Sdn Bhd has developed Proline v3.0, their flagship product – an all-in-one business operations and intelligence software designed to increase productivity, efficiency and higher bottom-line. Developed since 2000, the business software which caters to small and medium businesses, provides an integrated solution to accounting, inventory and CRM systems, and is more effective than individual standalone applications. The software will be launched on May 20, with a FREE version to get your business started. Tan said the challenge to go fully computerised starts by first understanding how the system works, followed by testing it in small scale before moving the rest of the operations into the cycle. For example, with ProLine v3.0, productivity can be achieved by leveraging on computing power to automate most of the tedious work like sending emails and reminding customers for payment. Founded in 2000, Datum is a rapidly growing business productivity company. 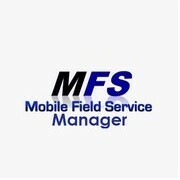 It’s mission is to improve life quality of working people. Its core business is implementing software solutions for companies and IT related support services such as website development and outsourced IT management. Since 2004, Datum has adopted the tagline: “People Don’t Work. Computers Do!” which has gotten many interesting feedback. To some, it was perceived as a bold statement but to Tan and his team, it was a journey of the putting systems into computers and making it a reality. After years in business, software engineering and system architecture, Tan understands enough of business to become proficient at extracting requirements from real-world issues, draw up a succinct design and convert laymen terms to computer language. “We are looking forward to develop future solutions with web technologies to provide more freedom to users. 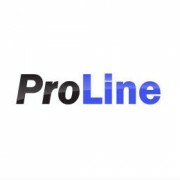 ProLine v3.0 is just the beginning of the product line that Datum will be launching. We have planned for more products and always finding new ways on how business can benefit from the computers,” he added. Q: What is a business software? Business software is software specifically designed for business operations. There are softwares for specialised industries such as manufacturing, and software in general like accounting or CRM. ProLine sits in the middle by distilling various part of specialised industries and integrating it with general modules. Q: Why is it important to synchronise your data? 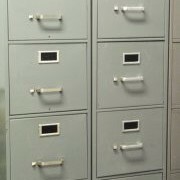 To have all data linked and organised together is important to eliminate double work and allow better intelligence. Data is everywhere and most of the time, it is not placed in convenient places therefore not fully used to make information meaningful to assist in daily activities. Q: What is Proline v3.0 and how do you use it? ProLine v3.0, a business software that has evolved over the past 10 years, and is our latest version launched in conjunction with Datum’s 10th anniversary. Touted as the All-In-One business suite, ProLine 3.0 includes multitude of functions ranging from Customer Relationship Management (CRM), Sales Force Automation (SFA), E-Filing, Order / Project Management, Accounting, Inventory, Field Service, Time Sheet and few other notable features. It is a software for business operation, not just accounting alone and it can be used in a standalone PC, or upgradable in a multi-user network environment with up to 50 PCs or more. Q: What research has gone into creating this product? Developed over the years from feedback by clienteles, ProLine v3.0 is now used by Datum’s office and clients to boost productivity to its daily operation as part of their Standard Operation Procedures (SOPs). With intensive R&D five years ago, each version is now more matured as we put all our business understanding and best practices into the software while minimising data entry to ensure it is usable and friendly for the users. Q: What inspired you to develop this software? Learning from mistakes of my own and others, I found we spent too much time on issues that we can prevent in the first place. From here, I’ve been inspired to create solutions that can help business and companies to rely on computers to work rather than human power. ProLine is developed to keep businesses focused on their specialisation while keeping the paperwork to a minimum. For example, the easiest way to increase sales is to spend more time in sales related activities rather than firefighting and back-office work. Reporting for example, should be as easy as checking your email, rather than focusing on a spreadsheet with your fingers on the calculator. Q: How can I get a copy of this software? 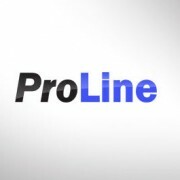 ProLine v3.0 is now available as a FREE download. The All-In-One trial version is valid 30 days and includes complete features. 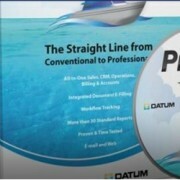 You can download the software at www.datumcorp.com/proline. For more info go to www.datumcorp.com. Save Time and Money with ProLine MFS! Try It For Free! Join Our ProLine for Accounting Facebook Group!